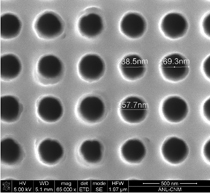 Creatv has developed a fabrication process to make high-porosity polymer nanofilters with smooth, uniform straight nanopores and high-aspect-ratio. This method can produce a new generation of high-precision, high-porosity, biocompatible filters with predetermined pore sizes. SEM of etched polyimide film. 250 nm pore diameter and 400 nm periodicity. 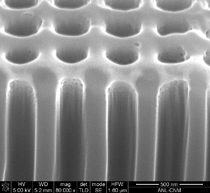 Enlarged view of etched pores. Chromium coated polyimide film before etching with 130 nm pore diameter and 400 nm periodicity. 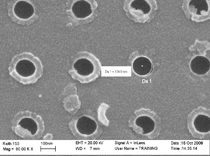 Cross-sectional view of SEM of a polyimide film. Copyright © 2016 Creatv MicroTech, Inc. All rights reserved.